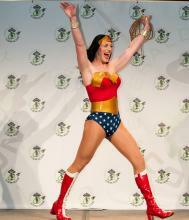 Searching on blogs about technology and random stuff I found this picture about the new Wonder Woman costume. For fans of the long-standing television series where Lynda Carter played Wonder Woman, this may be good news because it seems to be more action to the Amazon, but in this case will be Adrianne Palicki who will wear the uniform, there are significant changes like the color of the boots and with new latex leggins or other material and the top with new design . I don't think it's latex. Look at the seams - they are sewn, not glued. And wrinkles do not look like latex. I would say that it's vinyl coated lycra. I would like to proved mistaken. I don't think it looks like latex either, but it does look highly photochopped. Ridiculous... Antifetishism and radical feminism in action. "Stop depicting women as lust objects!" BTW, I have a couple of ad pics on this subject. Old news, I know, but the new WW series has been cancelled after the pilot episode bombed in previews.